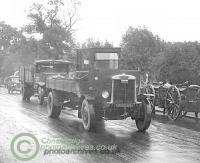 Beginning of production in 1940 of heavy 3-axle truck series L, prototypes of future long-haul tractors, allowed developing multi-purpose military chassis LMSW (6x6) with a 6-cylinder an overhead valve gasoline engine (10.0 l, 160 hp) and 5-speed gearbox. In 1941-1944 using this chassis, 664 ballast tractors and chassis for recovery vehicles were made. The next models were produced: LMSW-23 - repair and recovery vehicle with a closed cabin. Body and crane equipment was made by the GarWood Company. In 1941-1942 for the UK were produced 193 these wreckers. LMSW-39 - repair and recovery vehicle with a closed cabin. The crane equipment was made by the Mack. In 1941-42, 181 wreckers were produced. LMSW-53 - repair and recovery vehicle with a closed cabin. The crane equipment made by the GarWood Company, with two gibbets, the total payload is 14.5 tons (meter). In 1942-1944, 130 wreckers were made for Canada. LMSW-57 - the same as the LMSW-53, but with a soft top cab. In 1942-1944, 160 wreckers were made for Canada.